Our guide will meet you as you pass through the customs upon your arrival at Beijing Airport, and help you check in at the hotel. You can have a good rest to prepare for the exploration next day or to orient yourself to the city on your own. After breakfast, you will start the day with a visit to Tiananmen Square. 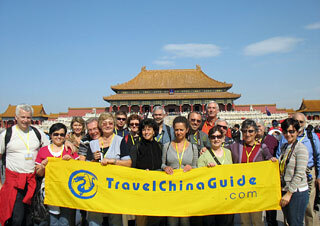 Following our guide across the square, you reach the entrance of the imperial palace - the Forbidden City. This Chinese imperial palace was home to emperors of the Ming and Qing dynasties, so you will see symbols of the royal family everywhere in the buildings, such as carved dragons, statues of lions and divine creatures, red walls and golden roofs. Around noon, we will treat you to an a la carte welcome lunch with Peking duck (valued at CNY150.00 per person and included in our price) at an elegant Chinese restaurant off the regular tourist beat. After lunch, you will visit the imperial altar of the Ming and Qing dynasties, the Temple of Heaven, where emperors renewed their divine rights to rule through sacrificial offers to the gods. Tonight, a lively Chinese Kong Fu Show is waiting for you at the Red Theatre. Today, we will set off early to visit Mutianyu Great Wall. Dated back to the Ming Dynasty, the Great Wall had seen many military actions in defense of the empire. You will take cable car reaching the wall and see the grandeur in miles of walls sprawling along the tops of mountain ridges. 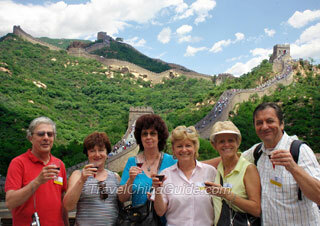 At this moment, we dole out red wine for a group toasting to memorize the joy of travel. After enjoying the amazing views, you will take cable car descending from the wall. 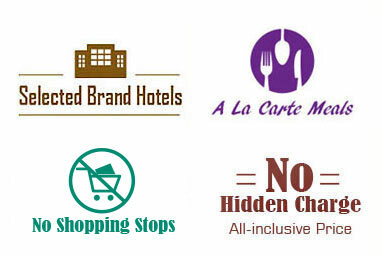 We will skip lunch for lack of choice local fare. We would rather suggest that you have a generous breakfast and have some fast food for lunch by yourself. On the way back to the urban area, you will have a brief stop near the Olympic National Stadium (Bird's Nest) to take photos with the tourist icon. We also leave you some free time in a featured local market before driving back to the hotel. In the morning, proceed to the Summer Palace, the former royal garden of the Qing Dynasty. In the garden, you will see Kunming Lake, Wanshou Hill, the long Seventeen-Arch Bridge, and Suzhou Market Street. Later we will retrace the unique Beijing Hutong culture by riding a rickshaw through the old Hutong alleys, taking in the oldest grey brick of courtyard residence and lifestyles of local families and experiencing Chinese Paper Cutting. After an a la carte lunch (valued at CNY150.00 per person and included in our price) at a fancy restaurant with delicious food and great atmosphere, you are going to catch a flight for Xi'an, where our local guide will meet and transfer you to the hotel. 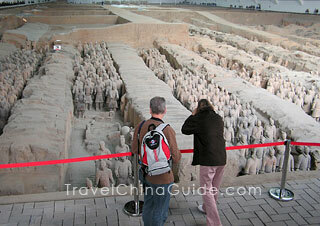 Your first destination today is the Terracotta Army. The life-size clay figures, probably fashioned after individual live models, frozen in time, and arranged in battle order; even the expressions on the horses are individualized. You can also see the delicate Bronze Chariot and Horses, and bronze vessels and weapons. Around noon, we will serve you a home-cooked a la carte lunch (valued at CNY120.00 per person and included in our price) at a local family home. It is a good occasion for you to join in our cooking class and learn from the hosts if you are interested in Chinese cuisine. You can also acquaint yourself with domestic issues when talking with your hosts. After lunch, visit Xi'an Museum and the Small Wild Goose Pagoda. The brick pagoda is a miracle built in the Tang Dynasty that is so well preserved after 1,300 years. Later you will be entertained by the Tang Dynasty Music and Dance Show when partaking of the famous Dumpling Dinner. You will spend the whole morning around the City Wall area. First, our guide will take you to the City Wall Park. It is a place full of life and vigor since a lot of locals, especially elders come here doing morning exercises, dancing, and singing local opera. You might want to join in the Tai Chi practice to experience the authentic slow movement art. Then follow the guide to go up the City Wall. Due to the sheer size of the wall, it is better to take a bike ride on the top of it (The bike rental is an out of pocket expense). You can stop to take photos of the beautiful city views. Around noon, you will dine a la carte lunch (valued at CNY120.00 per person and included in our price) at a famous local restaurant, and then get down to Shaanxi History Museum which features a huge collection. There, you will learn much about Chinese history and culture. Next, you will proceed to the Muslim Quarter and also visit the Great Mosque. Built in 742 during the Tang Dynasty, the mosque is the earliest Muslim house of worship in Xi'an. You will check out of Xi'an hotel and catch a morning flight to Guilin. Our guide will greet you in the airport and transfer you to the hotel in downtown. Have a short rest and start your travel in the picturesque Guilin. First you will see the Reed Flute Cave, a karst cave boasting varies shapes of stalactites and stalagmites. Then followed by the Elephant Trunk Hill. As the name suggests, it features a huge rock elephant-like with a long trunk. 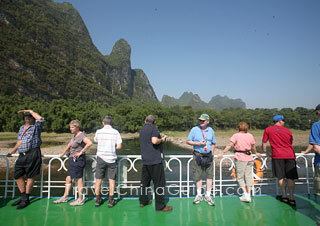 Fresh from a hotel breakfast you will embark on your Li River Cruise. You will be mesmerized by clear waters and grotesque peaks along the river. You are well advised to have a big breakfast in the hotel rather than having the box lunch with plain food onboard the boat. 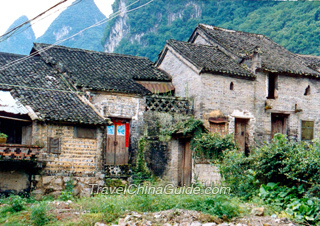 Disembark at Yangshuo and walk through the West Street, and then you will be driven along country roads and take in the fresh and clean rural scenery in Yangshuo. A scheduled stop is at a local farmer's house. Finally, we will bring you back to Guilin city. You have the whole morning to explore Guilin city on your own. In the afternoon, our guide will transfer you to Guilin West Railway Station to take a 3-hour high speed train to Hong Kong. Your escorted tour ends when you leave Guilin. Upon arrival at Hong Kong West Kowloon Station, you should go to the 4-star Regal Kowloon Hotel we booked for you by yourself. You can walk for about 5 minutes to Austin Station and take West Rail Line to East Tsim Sha Tsui Station. Then get out of the station from Exit P2 and walk for about 10 minutes to reach the hotel. If you take a taxi directly, the ride takes around 10 minutes and costs HK$35 or so. The hotel room comes with breakfast. You have the whole day to explore the vibrant Hong Kong on your own. You could walk westward for about 370 meters (0.2 miles) to Tsim Sha Tsui Mody Road Station. Take the KMB Bus No.8, 28, 8A or 5C for two stops to Tsim Sha Tsui Pier Station. Walk to the Star Ferry Prier to take the iconic Star Ferry to Central. Not far from the pier, at the bus terminus on the Exchange Square, you could take bus 6, 6A, 6X, 60, and 260 to Stanley, where you will be interested in the colorful Stanley Market and having lunch at an elegant restaurant. After lunch, take CityBus No. 6 and get off at Bowen Road, Stubbs Road Station, from where the Bus No. 15 will take you up to the Victoria Peak. 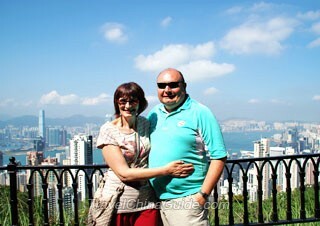 It is the best place to have a panoramic view of Hong Kong Island. Finally, you could go back to Central by bus and take a Star ferry back to the Victoria Harbor in time to watch the wonderful A Symphony of Lights at 20:00. After breakfast, check out the hotel and take the airport shuttle bus or bus A21 to the airport for your homeward flight. Should you plan to stay longer in Hong Kong, we are there to assist you with the hotel bookings. Selina was very good, handled all our questions and issues very well. Has done an excellent job so far. First of all, let me say that the whole journey was a wonderful experience and certainly excellent value for money. The guides overall were very knowledgeable and did generally go out of their way to help my companion who had some mobility problems. David in Beijing and Jessie in Guilin stand out as exceptional. They were personable and seemed really to care about us. My friend was going to forgo the walk to the Great Wall, but David came back and personally escorted her at a slow pace so she would not miss this once in a lifetime opportunity. Service above and beyond the call of duty! I’m afraid your time is not enough, since you need at least 2 hours to check in and complete the procedures and then it takes at least 2 hours on the way, so you don’t have time to visit. Maybe you can kill time in the airport or change your ticket. im wanting to take the fast train to xian from beijing...im staying atour hotel in xian ..
what train do i take to get there? 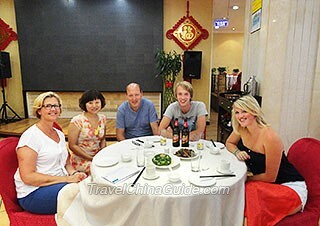 There are many atour hotels in Xi'an, and I’ll take the one near Bell Tower as the example. You can take subway line 2 straight to Bell Tower and then walk west for 100m to the hotel. We are intending to travel from Zurich (Switzerland) to Danang (Vietnam) and might stop over in Hong Kong (arrival in HKG at 6:30 AM and departure at 18:05, the same day, my wife has a Vietnamese passport with Swiss resident permit (I am Swiss citizen), does she need a visa to visit Hong Kong city and back to airport (maybe for maximum 10 hrs) to continue our trip to Vietnam the same day? Oh, your wife will need to hold a visa for traveling in downtown HK, and it is best to apply for one in advance. We will fly from Beijing to Xi'an and stay at Citadines Central Xi'an. How we go to the hotel by airport shuttle bus? You may take shuttle bus Xishaomen Line and get off at the terminal station. 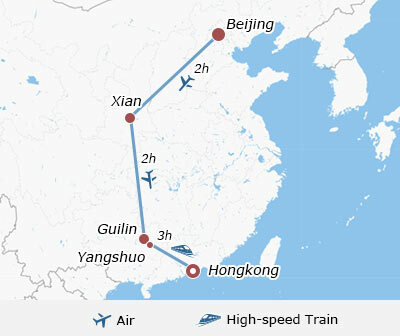 The trip takes around an hour and CNY25 per person. Then take a taxi to your hotel at a cost of around CNY10. I'm coming with my family on December 26-2 January can see the snow . I'm coming with my family 3 person on December 26 to 2 January can I see the snow. In Beijing how many places I can visit 7 days can you give the place name? Well, according to the previous weather records, there will be a high possibility to see the snow in the end of Dec. and early Jan. You are advised to bring enough warm clothes.